I think I am getting a little tired, but yesterday and today the painting definitely is not coming easily, my painting today started out as a rose in a vase....but definitely not sharing,...so I moved on to this young horse on the beach of North Carolina. A painting a day is a tough challenge. There will be days when all seems bleak.. because you're only human, with all the foibles that entails. I think even the mistakes in watercolour we learn from - but can understand if something looks so grim you don't want to share. Your horses always look good - and this one does too. Thanks Pat, I needed that! Today is a new day and ready to give it a another go! 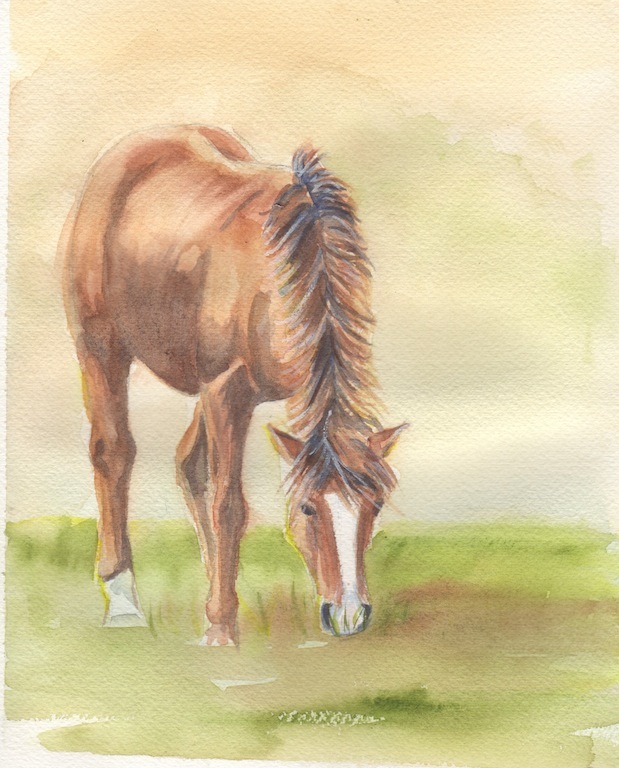 How did you get the color "sorrel" with your water colors? I use a combination of burnt sienna, and raw sienna and burnt umber, sometimes a touch of alizarin crimson to give a little glow!